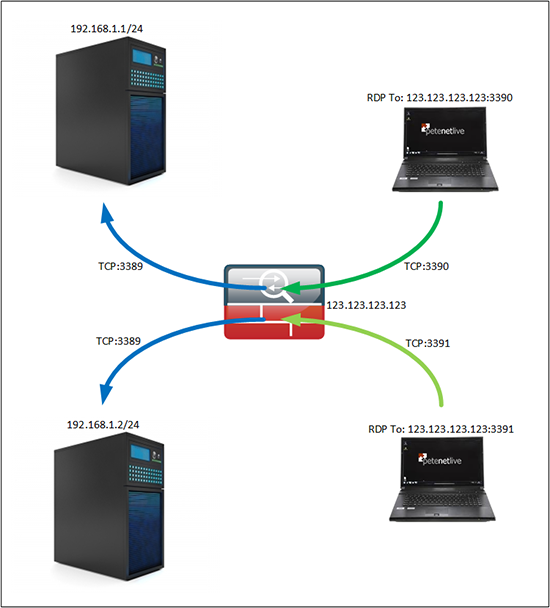 A very long time ago I wrote an article about how to port forward from a public IP address to multiple servers for RDP. Basically you would connect to the firewall using various different ports, and the firewall would change the port to the correct one for RDP (TCP port 3389, unless you changed it on the machine). Then send it to the correct server, so you could manage multiple servers from the same public IP. Now that was so long ago it was before the version 8.3 NAT changes. This week I was working on a problem where every change I made that had to be tested meant I had to swap VPNs, and reconnect to servers and test comms. This was getting a bit time consuming so I needed a public server to jump on for testing. I didn’t want to expose RDP to my server, so I planned to use a different port and translate that port on the firewall. But how to do that with modern ASA code? 2. Allow the traffic, (read this article before executing the access-group command). So (as above), I’ll connect to the first server on port 3390, and the second on port 3391. Then Port Forward AND TRANSLATE those ports to the correct internal servers.